Holy Week begins Sunday evening at 6:30 PM with our first Bridegroom Service. We will also celebrate this service on Monday and Tuesday evening at 6:30 PM. Presanctified Liturgy will be celebrated Monday and Tuesday at 9:30 AM. To learn more about the Bridegroom Service, please click the image. Click here for the 2019 Holy Week Schedule. See you in Church! Click to read an article written by Fr. 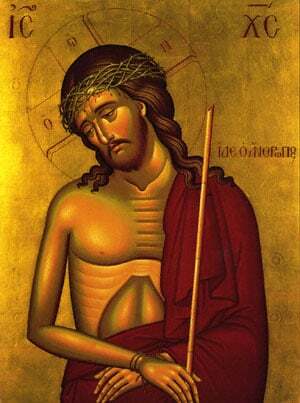 Demetrios Tsikouris about the beautiful Holy Week experience in the Orthodox Church. Orthodoxy embraces people of all backgrounds in authentic Christian fellowship...Click here to learn about the journey to Orthodoxy of a few of our newest members. Join us on April 17th for Presactified Liturgy at 5:30 PM followed by a potluck dinner and a discussion from Ted Cherpas about his journey through the Holy Lands during Holy Week. Please come see our parish friend Ted and listen to his amazing story. Orthodox Christians desire to serve and not to be served... Join us the last Tuesday of each month for our community meal. Orthodox Christians steadfastly hold to the traditional teachings and morals of the Christian faith “which was once and for all delivered to the saints.” (Jude 3) Click to learn more. Orthodox Christians worship services contains an unparalleled richness and depth...Join us weekly for service on Wednesday evening or Divine Liturgy on Sunday mornings! St. John the Divine Parish - Living the Orthodox Christian Way of Life. Come and experience what it means to live the Ancient Apostolic Faith of Christ. All are welcome! Join us on for Divine Liturgy every Sunday at 10:00 AM. Sunday School Meets weekly for prayer and classes at 9:15 AM. For information on our Lenten and Holy Week services please contact the Church office at (304) 233-0757 between the hours of 9:00 AM - 12:00 PM and 1:00 PM - 3:00 PM, Monday through Friday.